We have pitted the ASUS ZenFone Max Plus against the Vivo V7. See how they fair up against each other. 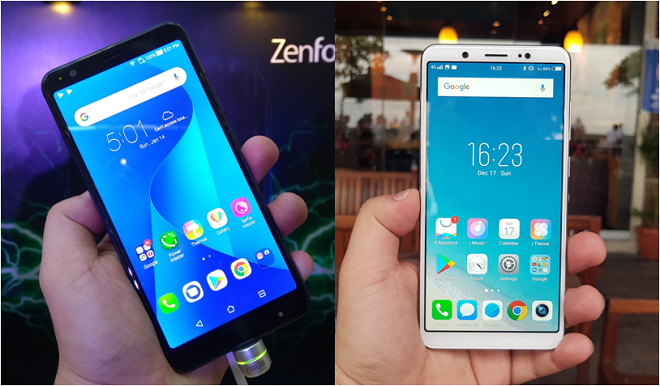 ASUS ZenFone Max Plus and the Vivo V7 are making waves in the mid-range department. The former hits the Philippines by storm last weekend with the company trying to take a bigger share in the mid-range pie. Meanwhile, the Vivo V7 has recently dropped its price to Php 12,990 which instantly made it a steal buy. For this round, we have pitted the ASUS ZenFone Max Plus to the newly price-dropped VIVO V7. Let's check it out. Both measures 5.7-inch display with 18:9 Aspect ratio. This captures a sweet spot for those who want to have a smaller footprint with wider viewing real estate. Both handsets do not disappoint when it comes to the display. However, we could instantly tell that ASUS' ZenFone Max Plus has the edge when it comes to the display due to its Full HD+ 1080 x 2160 pixel resolution panel. The Vivo V7 only comes with an HD+ 720 x 1440p resolution. However, Vivo V7's display is treated with Gorilla Glass unlike the ASUS ZenFone Max Plus' panel. Under the hood, both phones tick with octa-core processors. ASUS ZenFone Max Plus runs with MediaTek MT6750T while the Vivo V7 is powered by a Qualcomm Snapdragon 450. The former runs at 1.5GHz while the latter comes with a faster clock-speed at 1.8GHz. Vivo V7's Snapdragon 450 is a newer-generation SoC with a more powerful Adreno 506 GPU. Both handsets pack 4GB of RAM. In the camera department, both smartphones beat one another in their respective feature sets. ASUS ZenFone Max Plus is the winner when we talk about the rear camera due to the fact that it sports a dual-camera module (16MP + 8MP). The Vivo V7, on the other hand, captures way better selfies with its 24MP front camera. The Vivo V7 is powered by 3000 mAh battery which could serve long mileage (away from the wall outlet) for the reason that it touts an HD+ screen resolution and a power efficient chipset. Meanwhile, the ASUS ZenFone Max Plus is dubbed as the "Battery King" due to the 4130 mAh pack. On paper, it looks like the ASUS ZenFone Max Plus aces the battery segment. But in our opinion, it would not leave the Vivo V7's battery far behind in this comparison since the Max Plus also has an FHD+ screen to feed. The Vivo V7 is now priced at Php 12,990 which is a far better deal than its Php 14,990 introductory price. Meanwhile, you can get the ASUS ZenFone Max Plus at Php 11,995 which is also a great deal considering that it packs a bucket-full of exciting features. On paper, ASUS ZenFone Max Plus is a great contender in this price range. The older chipset might shrug off some buyers. But we love how the company puts almost everything in the table at a very competitive price. The Vivo V7, on the other hand, is the selfie-centric smartphone which everyone loves. It's also proven to be a good worker with long battery life.